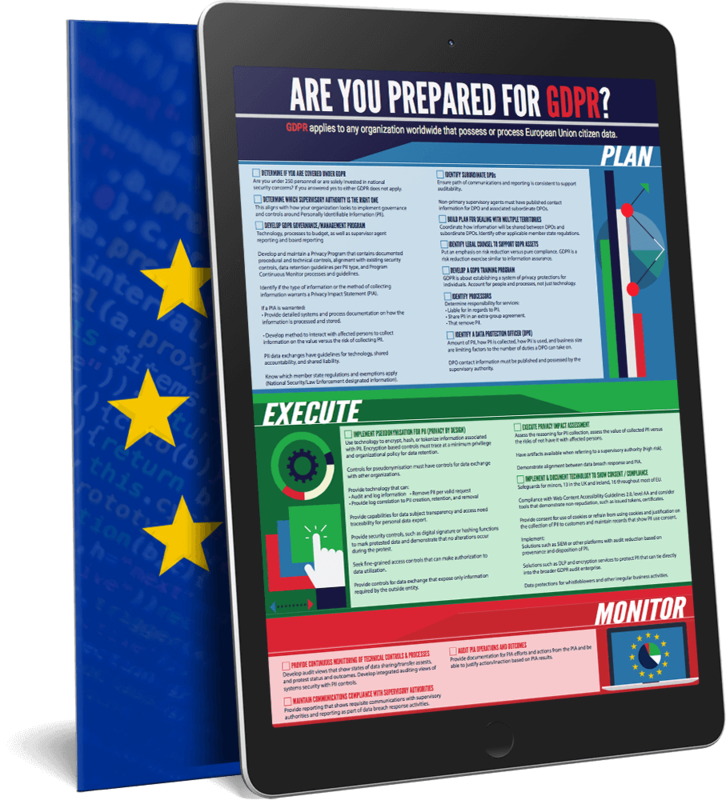 With the deadline for compliance quickly approaching, make sure your organization is prepared for GDPR with a comprehensive checklist. If you’d like a printable PDF of this checklist, please fill out the form at the bottom of the page. Click each item below for additional details. Are you under 250 personnel or are solely invested in national security concerns? If you answered yes to either GDPR does not apply. This aligns with how your organization looks to implement governance and controls around Personally Identifiable Information (PII). Develop and maintain a Privacy Program that contains documented procedural and technical controls, alignment with exiting security controls. Data retention guidelines per PII Type. Program Continuous Monitor processes and guidelines. Identify if the type of information or the method of collecting information warrants a Privacy Impact Statement (PIA). If a PIA is warranted, provide detailed systems and process documentation on how the information is processed, and stored. If a PIA is warranted, develop method to interact with effected persons (like a focus group) to collect information on the value vs the risk of collecting PII. The amount of PII, how the PII is collected, how the PII is used, and the size of the business are limiting factors to how many other duties a Data Protection Officer (DPO) can take on. Make sure that contact information for the DPO is published and the supervisory authority has the DPO’s contact information. This is critical if dealing with multiple supervisory agents. The path of communications and reporting needs to be consistent to support auditability. Make sure that non-primary supervisory agents have the published contact information for the DPO and their associated subordinate DPO. How will information be relayed between DPO and subordinate DPOs? Identify any additional member state regulations that might apply. Focus on risk reduction versus pure compliance. GDPR is a risk reduction exercise just like information assurance. A low risk approach to compliance requires you to bury all of your PII processing technology under a bridge and only take cash for payments. GDPR is about a system of privacy protections for individuals. Make sure that people and processes are accounted for and not just the technology they use. Note that processors have liability (on a narrower focus) like controllers do. Determine responsibility for which services the processor is liable for in regards to PII. Determine responsibility for which services the processor is liable for that share PII in an extra-group agreement. Determine responsibility for which services the processor is liable for that remove PII. Use technology to encrypt, hash, or tokenize information associated with PII. Encryption based controls need to trace to least privilege and organizational policy for data retention. Controls for psuedonymisation need have controls for data exchange with other organizations. Provide technology that can audit and log information. Provide technology that can provably remove PII per valid request and provides log correlation to PII creation, retention, and removal. Capabilities for data subject transparency and access need traceability for personal data export. Implement data retention controls that remove PII once it is no longer operationally or legally required. Provide security controls, such as digital signature or hashing functions to mark protested data and demonstrate that is has not been altered during the protest. Look for fine-grained access controls that can make authorization to data utilization. Controls for data exchange need to expose only information required by the outside entity. Assess the reasoning for PII collection, assess the value of collected PII versus the risks of not having it with affected persons. Have artifacts available when referring to a supervisory authority (this is for high risk situations). Example 1: System that uses new technology to interact with individuals that could result in a data breach. Implement solutions such as SIEM or other platforms with audit reduction based on the provenance and disposition of PII. Implement processes for PII-intensive organizations such as HR that protect PII information. Implement solutions such as DLP and encryption services to protect PII that can directly tie into the broader GDPR audit enterprise. Monitor the organizational perimeter for BYOD, outbound information, as well as outside social media concerns. Data protections for whistle blowers and other irregular business activities. Develop audit views that show state of processing assets, states of data sharingtransfer assets, and of protest status and outcomes. Develop integrated auditing views of systems security with PII controls. Provide documentation for PIA efforts and actions from the PIA. Be able to justify actions (or no action) based on PIA results. Provide reporting that shows requisite communications with supervisory authorities. Provide reporting that shows details communications with supervisory authorities as part of data breach response activities.